You know what tiles are, right? We would have said yes, until we found out about DTILE. Made in the Netherlands, DTILE is a tile system that combines the satisfying simplicity of square tiles with a crazy amount of functionality and a super futuristic look. These are tiles on overdrive. 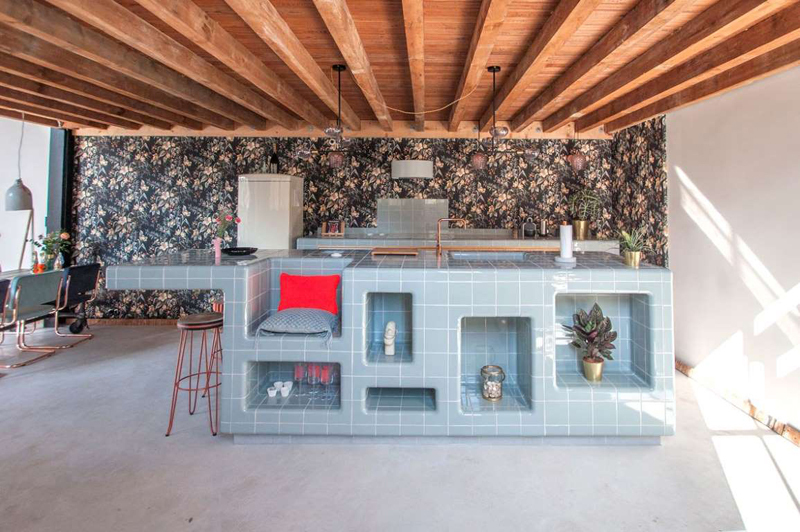 "We were always fascinated by the archetypal Dutch 15x15-cm white tile, the most ordinary and unpretentious tile there is," says Hajo de Boer, one of the brand's founders. 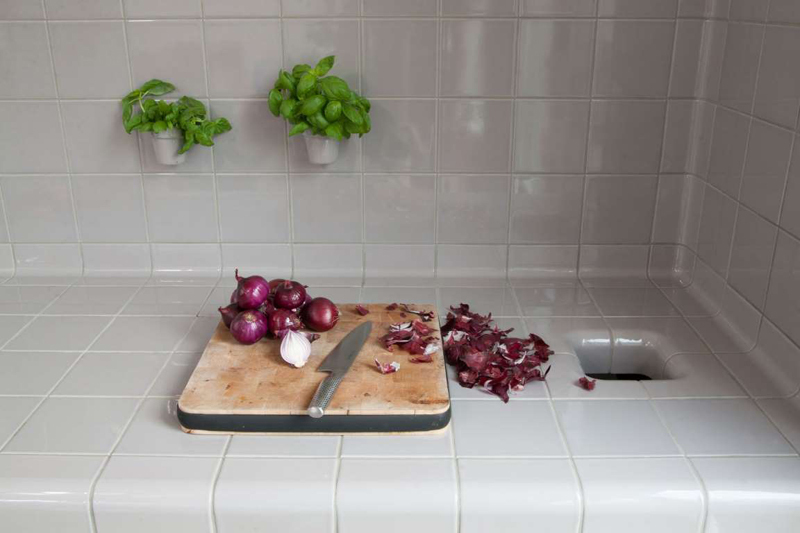 Beyond the tiles themselves, they loved the perfect grid created by contrasting grout, but not so much the wall hooks, toilet paper holders, and even air vents that are inevitably installed on top, requiring tiles to be cut and drilled to fit. "So we tried to invent a system that would allow for an uninterrupted grid, that enabled us to cover any surface with a blanket of tiles," says Hajo. Ideal, really! The system they came up with to rectify wrongs against tile grids is built on two "pillars," as Hajo calls them: function tiles, which have hooks and drains and magnets and even vents built right into their surface, and construction tiles, which are curved. See that blanket of tiles taking shape? © Architectural Digest A freestanding DTILE sink on a patio. © unknown The most satisfying trash chute we ever did see. 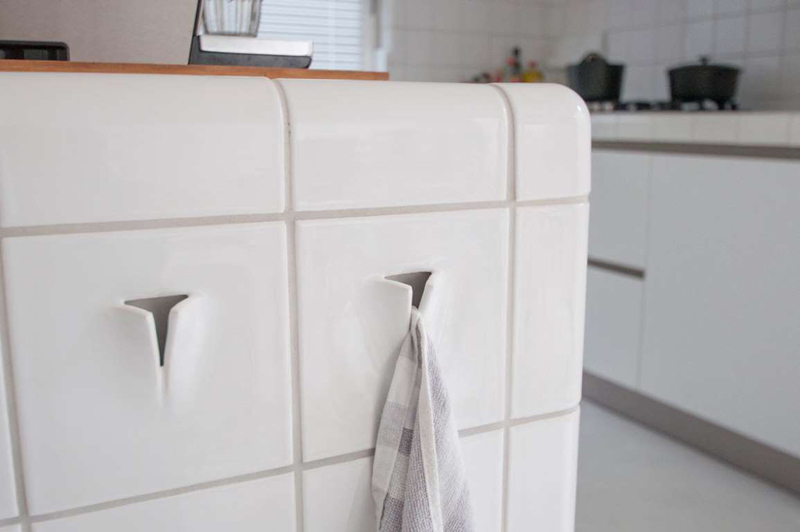 The edge of a counter, the corner of a bathroom wall—these surfaces can be wrapped allover in DTILE, softening hard right angles and making the entire surface look custom configured. Hajo reports that most of their customers seem to apply the tiles in bathrooms and kitchens (and can we just say yes, please to a DTILE kitchen countertop), but apparently DTILE fireplaces are a big thing as well. 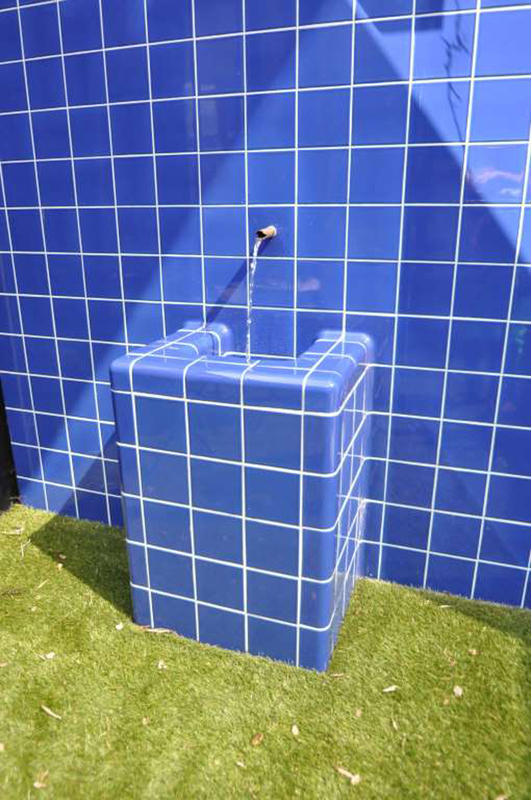 "We think that the tiles feel at home in many different environments and adjust well to different styles, so we like to be surprised by unusual applications," Hajo says. The only real no-no's are installing the tiles wrong, like directly on wood, which will cause them to crack later. But other than that they're pretty damn hardy. Because DTILEs are baked at a higher temperature than ordinary tiles, they can be used not just on counters and walls and floors, but outdoors. © Architectural Digest DTILE does towel hooks. When you're ready to commit to DTILES, the company will help draft you a design based on the dimensions of your space before you actually order. You'll either download their DTILE Sketchup Template or work directly with a team member to do it for you. Basically, you just want to get the dimensions exactly right so the tiles fit perfectly—cutting them would be an extremely sad interruption of the grid that would not make Hajo very happy. 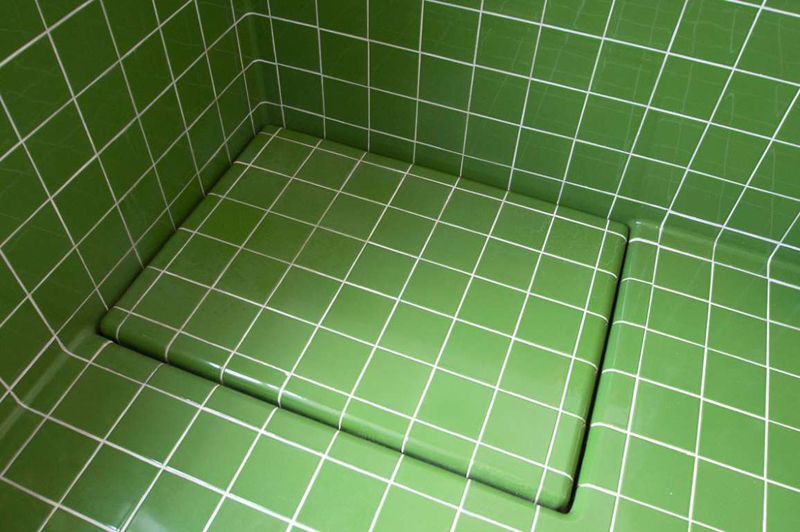 Installation, which they consider very straightforward for interior designers or "competent do-it-yourselfers," involves something called reinforced foam that'll go between the surface and the tile layer. But don't worry too much about the how-to for now; if you want to DTILE your bathroom their service team will basically walk you all the way through it or recommend a local contractor. The important takeaway right now is: How freaking amazing is a DTILE sink, trash chute, and wraparound counter! ?